Gaps and spaces in between your teeth not only put a damper on your smile but can pose a serious health concern as well. Missing teeth increase the chances of the developing periodontal (gum) disease or tooth decay. Everyday actions such as chewing, smiling and speaking may be more difficult with missing teeth. 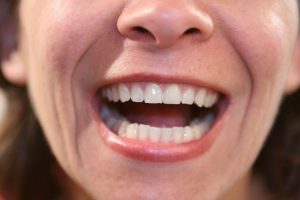 As a leading restorative and cosmetic dentist, Dr. Robert Milner offers several options for replacing missing teeth at his practice in Mission Viejo, including dental bridges. Dental bridges are a popular choice as they can realign an altered bite, restore normal chewing ability, prevent oral health problems and improve the appearance of your smile. Read on to learn more about dental bridges and whether they are right for you. 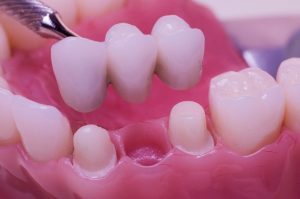 Can I Benefit from a Dental Bridge? There are several types of dental bridges to choose from, and Dr. Milner will work closely with you to choose the one that best fits your needs and goals. A traditional dental bridge consists of an artificial tooth supported on either side by a dental crown. The crowns fit over the teeth adjacent to the gap, and an artificial tooth bridges the gap. A cantilever dental bridge is made of two crowns side-by-side and an artificial tooth and is used when there are teeth on only one side of the gap. A resin-bonded bridge consists of an artificial tooth fused to metal bands. The artificial tooth fits into the gap and the metal bands are attached to the backsides of the teeth on either side of the gap. The health and beauty of your smile are important to us. We work with a dental laboratory that crafts quality restorations from strong, durable materials. Your bridge will be tailor-made to match your existing teeth for seamless results. The dental bridge placement typically takes place over the course of two visits to our office. During your first visit, Dr. Milner will prepare your teeth by reshaping the tooth or teeth that will surround the gap. He will then make an impression of your mouth to create a bridge that properly fits your bite. One or more temporary crowns will be placed on the tooth or teeth to prepare it to support the bridge. Once your bridge is ready, you will return to our Mission Viejo office for placement. Dr. Milner will position the bridge and make any last-minute adjustments to ensure it fits properly. He will then bond the bridge into place with a strong adhesive. Dr. Milner believes that function is just as important as appearance. Your new dental bridge will be durable and beautiful, and can last for many years with the proper care. Our dental team will gladly share tips on caring for your dental bridge. To learn more about how dental bridges can close the gap in your smile, contact Dr. Milner. Schedule by calling 949-859-8899 today.